FVS‘s project management was recognized with two prestigious awards last week at the International Association of Chiefs of Police (IACP) 2012 Annual Conference in San Diego, CA. 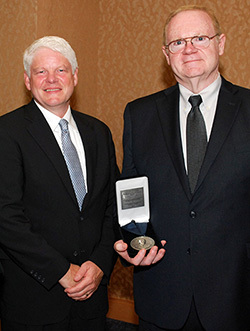 The 2012 August Vollmer Award for Excellence in Forensic Science was awarded to the Law Enforcmenet & Emergency Services Association (LEVA), and Grant Fredericks was on hand to accept the award for LEVA. Mr. Fredericks served as the Project Coordinator for LEVA’s assistance to the Vancouver Police Department’s investigation of the Stanley Cup Finals riots in June, 2011. During a two week period, a team of 50 forensic analysts worked under Fredericks’ direction with members of the Integrated Riot Investigation Team (IRIT) to analyze over 5,000 hours of video evidence collected from the riots. Additionally, the Vancouver Police Department and this project were awarded the prestigious 2012 International Association of Chiefs of Police (IACP) Award for Excellence in Criminal Investigation. “The IACP congratulates the Vancouver Police Department. This investigation is a prime example of the incredible outcome that can occur when law enforcement and private citizens come together to promote public safety and the pursuit of justice,” said Chief Walter A. McNeil, president of the IACP.